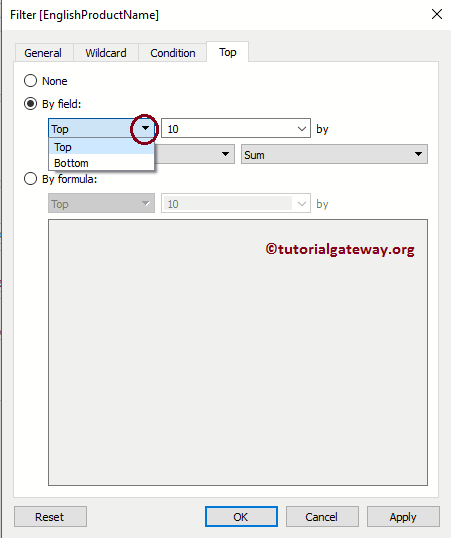 In this article we will show you, How create Bottom, or Top filters in Tableau with example. Before getting into this, Please refer Filters to understand the basic filtering techniques. For this bottom and top filters in Tableau demo, we are going to use the data source that we created in our previous article. 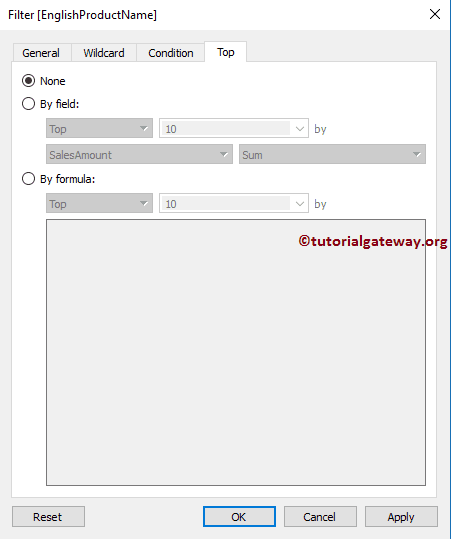 Please visit Data Labels in Tableau Reports article to understand the Data Source. 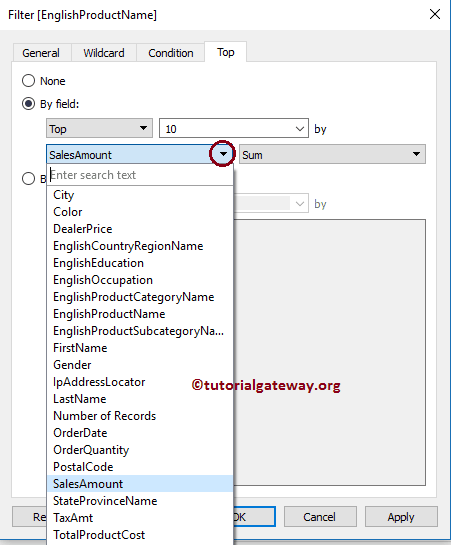 First, Drag and Drop the Sales Amount Measures region to Columns Shelf and English Product Name from Dimension Region to Rows Shelf. 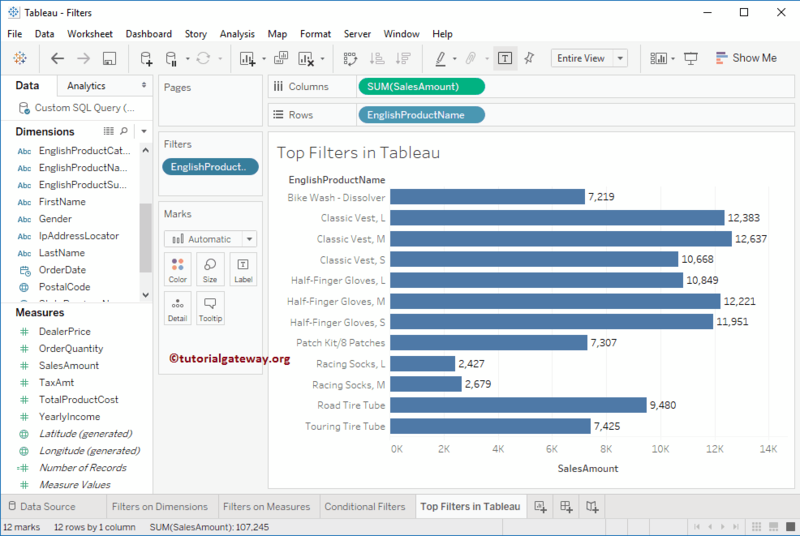 By default, tableau will generate the Bar Chart as shown below. 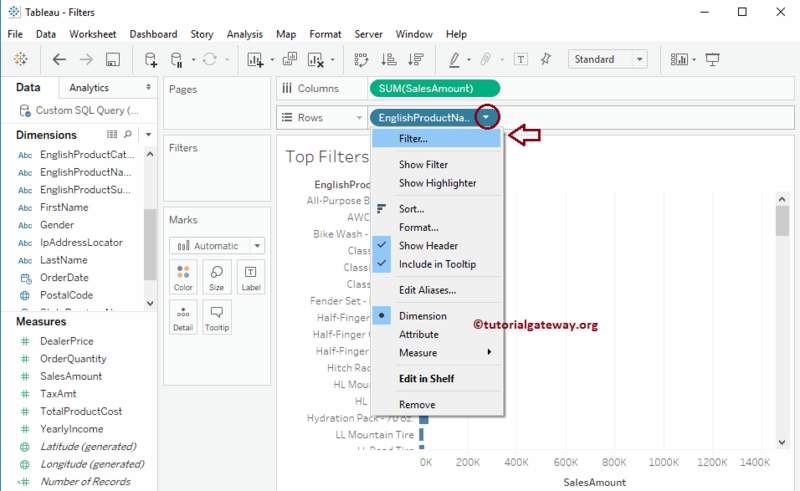 Here, we are going to add filter condition on English Product Name. So, please click on the down arrow beside the English Product Name present in the Row Shelf will open the menu as shown below. Here, you have to select the Filter.. option. First Dropdown List: By default, this will select the Top. But you can change the field to Bottom, by clicking the down arrow. Second Dropdown List: By default, this filed is filled with value 10. But you can change the value by clicking the down arrow. 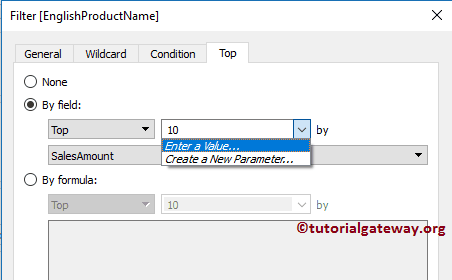 When you click that down arrow, it allows you to select or create new Parameter. Third Dropdown List: By default, this will select the Measure value present in the record. But you can change the filed by clicking the down arrow. When you click that down arrow, it displays the Measures, and Dimensions present in the data source. 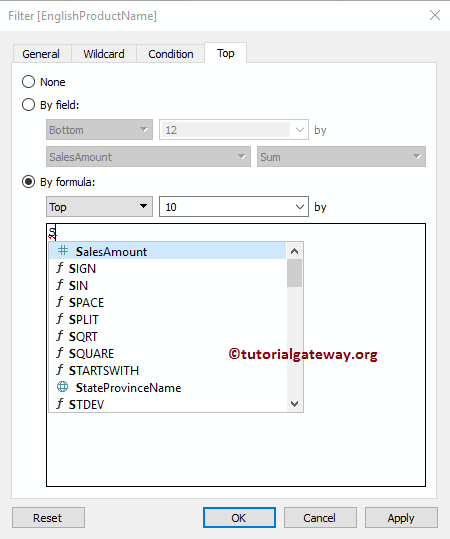 Fourth Dropdown List: By default, this will select the Aggregate Function that is applied to the Measure value. But you can change the function by clicking the down arrow. 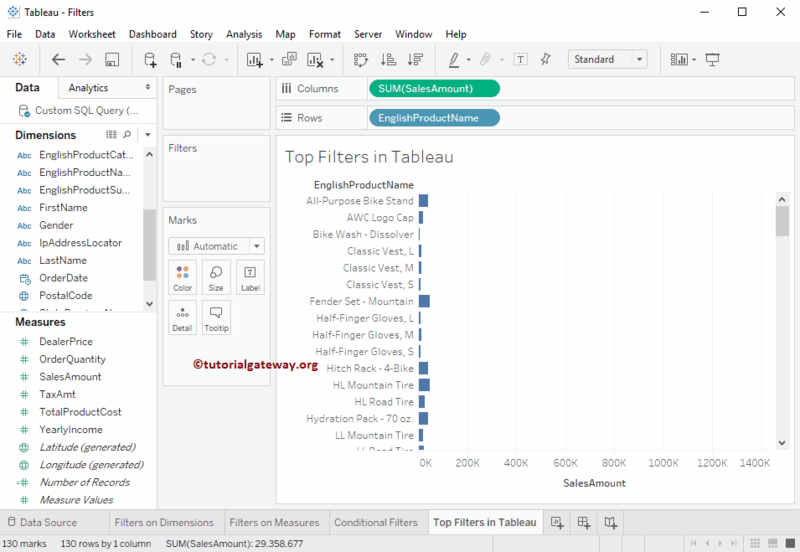 In this example, we use Tableau Top 10 filter to select top 10 records based on sum of sales amount. From the below screenshot you can observe that we are selecting the By filed section. 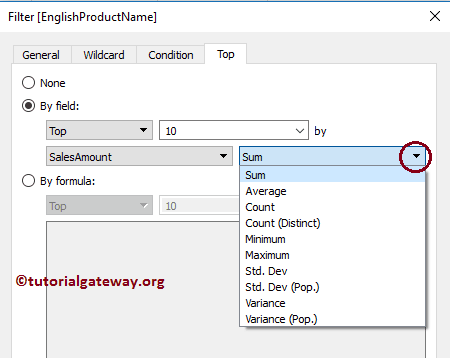 Next, we selected the Top, Sales Amount as the condition, Sum as the Aggregate function. And lastly, we added 10 value in the text box. Below report is displaying the Top 10 records according to their Sum of Sales Amount. Or we can say, Top ten records based on their sales Amount. 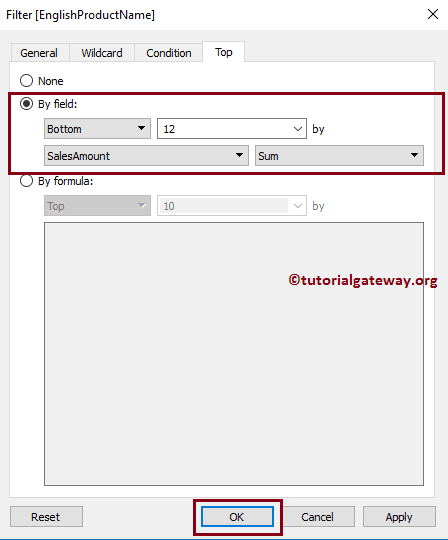 Here, in this example, we use Tableau bottom 10 filter to select bottom 12 records based on sum of sales amount column. Below report is displaying the bottom 12 records according to their Sum of Sales Amount. Or we can say, Least performing products. 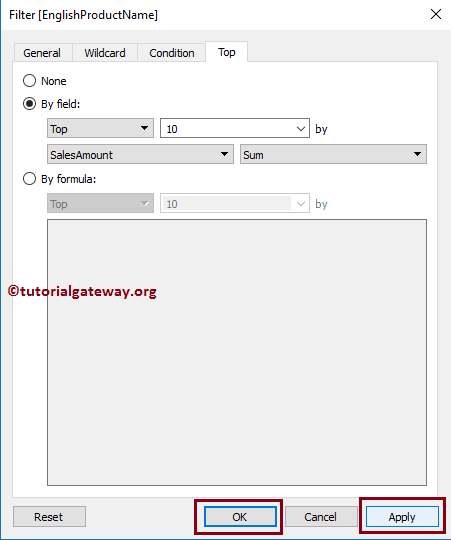 Here you can write your own custom and more complex conditions as the Filter condition. 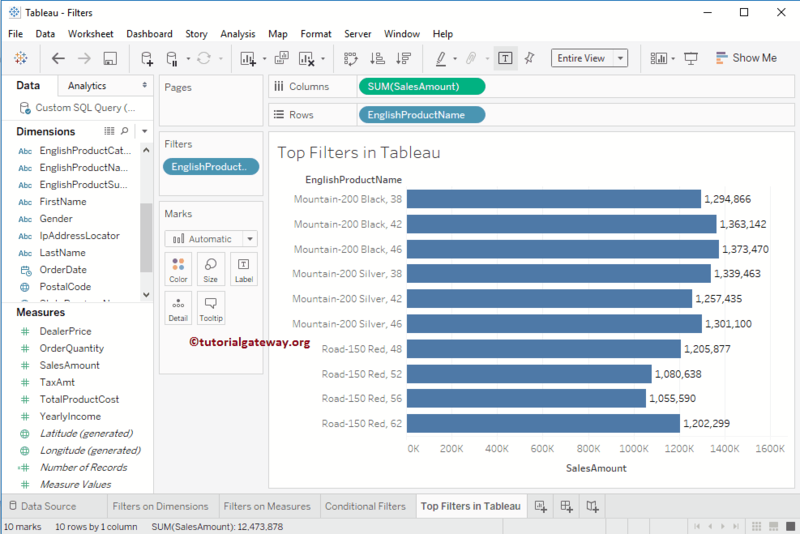 While you type any letter in that Text filed, Tableau intelligence will display the list of available options such as Filed Name and function names. 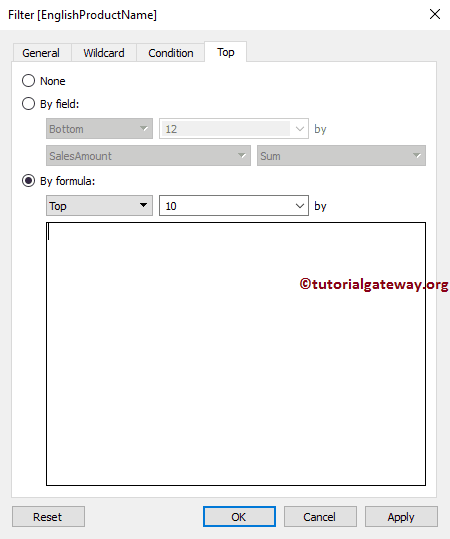 From the below screenshot you can observe that we had selected the By formula section. 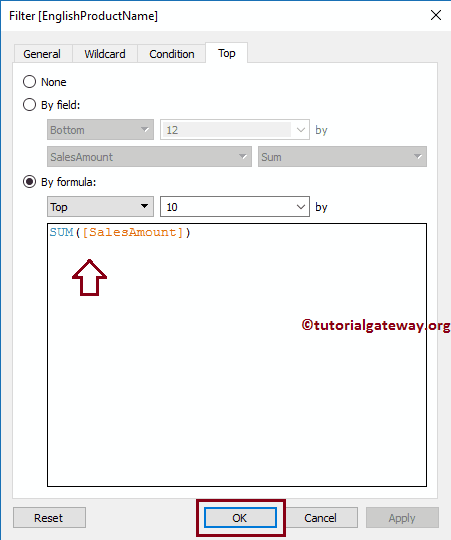 Next, we added SUM([SalesAmount]) code as the formula.